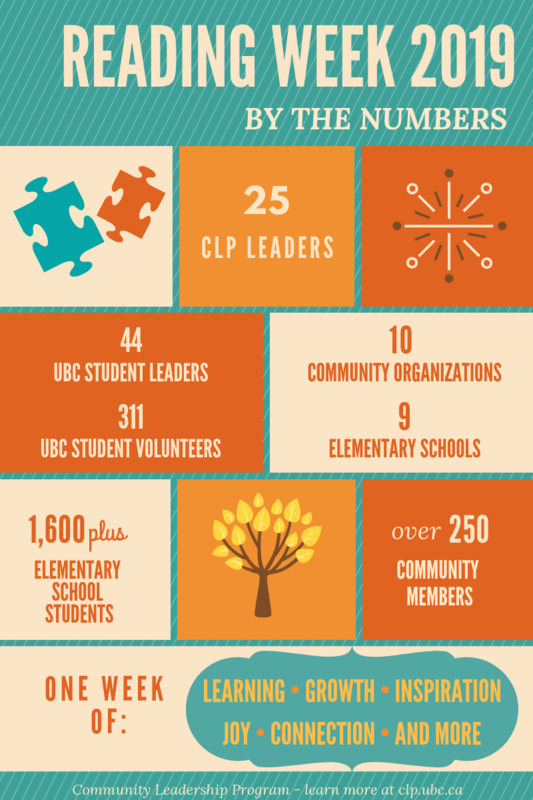 The UBC Community Leadership Program (CLP) is an innovative leadership development opportunity designed for emerging staff, faculty, and graduate student leaders. Offered in collaboration by UBC Human Resources and the Centre for Community Engagement, this program provides an opportunity for learners to explore leadership concepts and principles in a cohort learning environment through a series of interactive, participatory workshops and experiential learning. Participants learn and apply new leadership skills over the course of the fall through the blend of attending in-person workshops and creating collaborative partnerships with students and community organizations to plan and scope a community project. During the February UBC Reading Week, participants lead a group of UBC undergraduate students and implement the community-service learning project over three days in a school or non-profit organization. In addition to developing their own leadership skills, CLP participants support UBC students to cultivate their own leadership capacity and reflect on some of the real issues in community. We encourage all interested parties to attend one of our hour-long information sessions, in which you will learn about the program, the time requirements, and the program outcomes. Our program leads will be at the sessions to answer all your questions. Check out the impact of last year’s program participants!